Moe Lane » Tweet of the Day, This Pleases Me edition. Tweet of the Day, This Pleases Me edition. 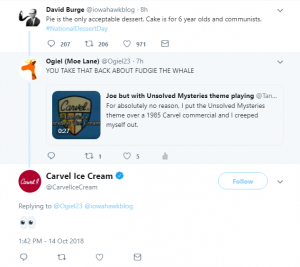 Carvel was very important to us, growing up in New Jersey. Fudgie the Whale was the swank birthday cake for a kid to get. I am absurdly pleased for getting this response. Baskin Robins ice cream cakes were the thing growing up in Northern, IL. But I do like the Carvels where I live in FL.